Are Automotive Tchotchkes Invading Your Workspace? Having just moved one timezone to the east, I've performed a fairly severe purge of the automotive tchotchkes that accreted in my office. Still, new ones keep showing up, and I cannot bear to ditch them. Farewell, Island That Rust Forgot! 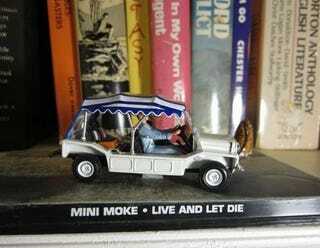 A team at last weekend's Arse Sweat-a-Palooza 24 Hours of LeMons race gave me a pretty cool diecast Live And Let Die Mini Moke, and it goes without saying that I'm going to give it a prominent place on the bookshelf next to my desk. LeMons Chief Perpetrator Jay Lamm gave me this great 1:18 diecast 1970 AMC Rebel Machine as a wedding gift, and only the Richard Nixon section of my library seemed suitable for its parking spot. Back in '07, when Jonny Lieberman, Davey Johnson, and I became obsessed with the Opel Manta, I ordered this beautiful LED-illuminated Manta "leuchtbild" from a seller on eBay Deutschland. The only proper place for my Manta shrine? Atop my much-duct-taped, on-its-11th-motherboard-since-1999 computer case, of course! How about you? Do you have four thousand slot cars piled up around your desk? Bent connecting rods? Aztek brochures?